Shall we charm the hours?" A Mini-festival campout on Lughnasadh weekend in the Redwoods at the Avenue of the Giants - open to all on the Druid path, as well as other Pagans. Activities will include Live Music by Anwyn & George Leverett, a Bardic circle for poetry and storytelling, workshops, readings, Reiki healings, music, drumming, shared feasting and rituals – also hiking, swimming and vision quests. We are very excited to announce that our "official Bards"
"It's not magic; it isn't a trick. 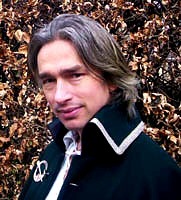 He penned a comprehensive book on Bardry released last Spring – The Bardic Handbook, The Complete Manual for the 21st Century Bard – which has achieved applause of approval in the Bardic world. You can learn more about this inspired work at: http://www.gothicimage.co.uk/bardic.html? He has also edited The Book of the Bardic Chair, released in April (UK limited edition initially, by Sulis Underground) – followed by a wider US version in the Autumn – published by RJ Stewart Books. It features a foreword by Professor Ronald Hutton; and contributions from Caitlin Matthews, RJ Stewart, John Michell and Dr. Graham Harvey, as well as all the Bards of Bath, Ovates and Druids. Plus, this work lists current Bardic Chairs, and how to set up your own. DE: What are the very basics a person needs to get started on the Bardic path, according to your new work, The Bardic Handbook, The Complete Manual for the 21st Century Bard? DE: I have read your (brilliant) work and have noted that it says that the Bardic path is a lifelong one. Are you still memorizing poetry, and how much these days? 'downloading' from the long-term memory a poem I've already learnt: dusting it off, polishing it up; other times, it's completely new ­ on average I can learn a poem in 30 minutes. A 30 verse one, like I did in front of 300 people at the Wessex Gathering (although I wrote, learnt and performed that in a week) takes a few days to master. As with stories and songs, you need to let them 'inhabit' you - live and breathe and dream them for a while - until you know them back-to-front, so that when you perform them you're not worried about forgetting the words (although stories are different, as you don't learn them verbatim) you're concentrating upon conveying the nuances of emotion & meaning, and letting the Awen come through. DE: Have you ever had an Otherworldly creature sing to you or give you a branch? T: In a way... 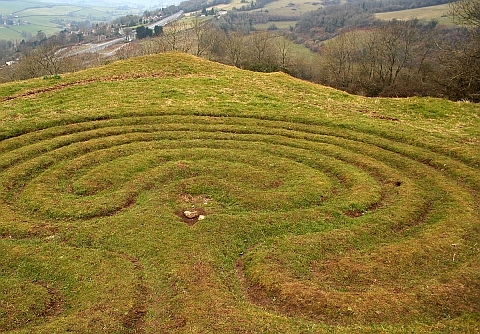 I was given a medicine rattle, unasked, on Solsbury Hill (our local sacred bump of Peter Gabriel fame) when I was taking part in a medicine circle with Roy Littlesun. A lady came up to me and said: 'I think you should have this.’ Since then, I've used it in my storytelling. Other than that, I'm still waiting for that faerie branch – in the meantime, I made my own. DE: If an aspiring Bard were enrolled in a University, what classes would you encourage her to take in order to form a good base of Bardic knowledge? DE: What was your most vivid Sidhe encounter? T: Wildcamping by myself near a barrow called 'the Giant's Grave' on the Wansdyke - a henge (ancient earthwork) stretching for miles across Somerset and Wiltshire. As I curled up around the fire, in the middle of the night, as the fire had died and I was beginning to feel cold, I felt a presence behind me – a 'man' on the edge of the grove. I was unable to move - sleep paralysis – as he approached, reached over...and stoked the fire into life, adding wood. Then he vanished. I wasn't able to sleep much after that, but it was nearly dawn by then. I am glad I asked for the blessing of the spirit of the (oak) grove before I made the fire and went to sleep. DE: What is the name of your harp? T: Haven't got one yet, as been working with a musician, but if I did I think it should be a private sacred thing (personal choice). DE: If you were Bran -- in The Voyage of Bran – and beheld a plate of food that reflected whatever you desired, would you eat of it? T: Well, there's strong taboos about eating faerie food, but it would be tempting – depends if I'd felt I'd achieved all I needed to in this world. I still have too many books to write and tales to tell before then! DE: Do you agree with the works of John and Caitlin Matthews that the Bardic path is necessarily a Shamanic one? What of urban Bards? T: I think they share similar roots, but you don't have to be a shaman to be a bard, and certainly not vice versa (although there are obvious overlaps). A powerful story performance should take the audience on a magical healing journey - just like shaman does. At the end of the day it is about connecting with your own tradition, and being authentic, your source of inspiration - if that's urban, so be it. The cities need healing and enchantment more than more wild places after all. DE: Which deity is your biggest taskmaster? Greatest inspiration? T: The Goddess in her many forms is my constant teacher and inspiration. DE: An Otherworldly creature offers you a "one-way trip" to 6th Century Wales: go or stay? T: Tempting...but I've got too much to do in this time, and I probably was there before anyway – I certainly connect with it more than any other period or place. DE: Anything else you would like to add for up-and-coming Bards? T: Believe in yourself – if you won't, no one else will. Stand up there and shine! In physical terms, I move through them; yet in metaphysical ones, they seem to move through me." time and space to connect with the life we have now. and their pain in our very bones and blood. past and future to the very moment of now. the many layers of the many worlds. Is to step into the fire. "This is an excerpt from Bernard Cornwell's "Warlord Chronicles" to remind us of what Beltane is really about and how our ancestors celebrated it. Your narrator is Derfel Cadarn – a member of Arthur's war band and Bard to Merlin – enjoy the tale and lap up the atmosphere!" 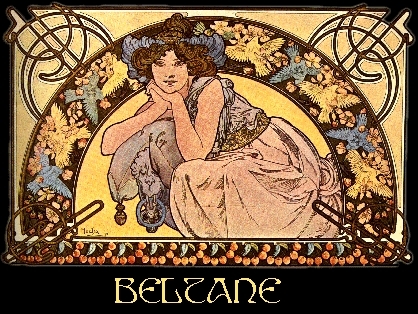 Beltane greets the new summer and on the eve of the feast we let all the fires in the village die. The kitchen fires, that had burned all winter long, went unfed for the day and so by nighttime they were nothing but embers. We raked them out, swept the hearths clean, then laid new fires, while on a hill to the east of the village we heaped two great piles of firewood, one of them stacked about the sacred tree that Merlin, our Druid, had selected. It was a young Hazel that we had cut down and carried ceremoniously through the village, across the stream and up the hill. We hung the tree with scraps of cloth, and all the houses, like the hall itself, were decked with new young Hazel boughs. That night, all across Britain, the fires were dead. On Beltane Eve the darkness rules. The feast was laid out in the hall, but there was no fire to cook it and no flame to light the high rafters. There was no light anywhere, except in those towns where Christians (spits to avert evil) defied the great God Bel and lit treacherous fires to insult him. But here in the countryside, the Pagan countryside, we made sure that all was dark in Bel's honour. At dusk we climbed the hill, a mass of villagers and spearmen driving cattle and sheep that were folded into wattle enclosures. Children played, but once the great dark fell the smallest of them fell asleep and their little bodies lay in the grass as the rest of us gathered about the unlit fires and sang the "Lament of Annwn". 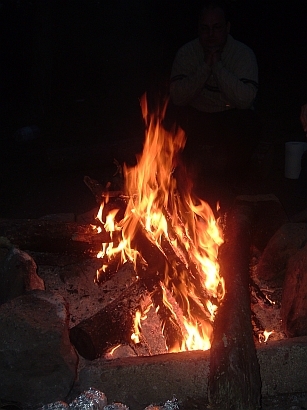 Then, in the darkest part of the night, we made the new summer's fire. Merlin made the flame by rubbing two sticks, while Issa, my head spearman, dribbled shavings of larch-wood kindling onto the spark that gave off a tiny wisp of smoke. The two men stooped to the tiny flame, blew on it, added more kindling, and at last a strong flame leapt up and all of us began to sing the "Chant of Belenus" as Merlin carried the new fire to the heaps of firewood. 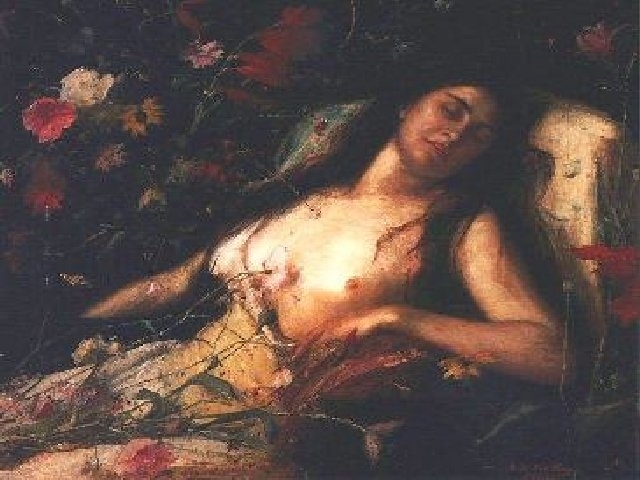 The sleeping children awoke and ran to find parents as the Beltane fires sprang high and bright. A goat was sacrificed once the fires were burning. As ever Ceinwyn, my wife, could not bear to watch and so turned away as the poor beasts throat was cut and Merlin scattered its blood on the grass so that he could find omens in the pattern that the sacrificial blood had formed. 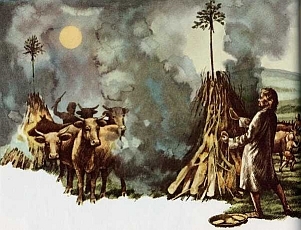 He then tossed the carcass onto the fire where the sacred Hazel now burned, and then the villagers fetched their cattle and sheep and drove them between the great blazes. We hung plaited straw collars about the cows’ necks, and then watched as young women danced between the fires to seek the blessings of Bel on their wombs. 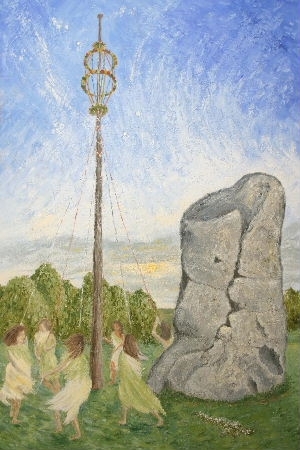 They had done this at Imbolc too, but it was always repeated at Beltane. 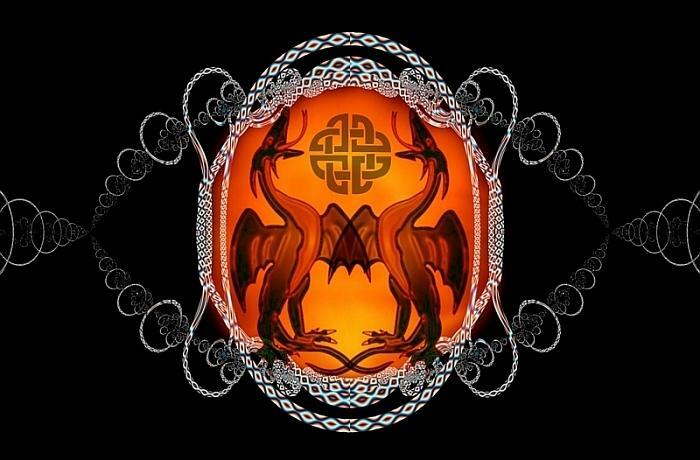 This was the first year that my daughter Morwenna was old enough to dance the fires and Arthur smiled at me as she twirled and leapt - for at the equinox she and his son, Gwydre, would be handfasted, so joining our two families more formally than our lifelong friendship could. I turned around and looked to the horizon and could see the bright flames of all the other Beltane fires burning in the distance. All over Wessex the fires were being lit in honour of the sun God - and I wondered how many more Beltane's we would enjoy before we once again had to fight the Saxons. My spearmen had brought two huge iron cauldrons filled with wood and each family took a piece, lit it upon the great fire and than ran down to their huts and homes to light their kitchen fire so that every fire in the village, that would burn until Samhain when we repeated the ritual, would have come from the fire of Bel himself. When every home had its fire we went to the hall and there lit the fire that would roast the coming feast for us. By now it was nearly dawn and so we crowded into the palisade to wait for Bel. 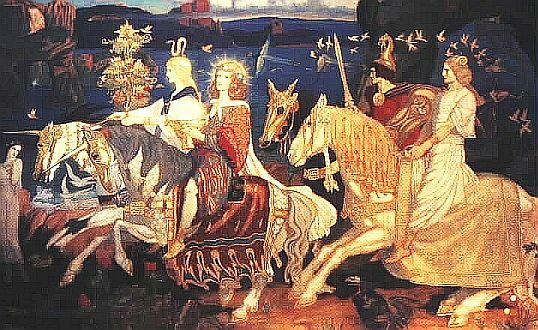 The instant that his first shaft showed above the eastern horizon we burst into a joyous song - the song of Lugh's birth and we danced as we sang, and as we sang Merlin called upon the Gods and the Elements to preserve and bless our village and the Sacred Island of Britain. We faced Bel once more as his warming rays lit the new day and heralded the start of summer and together the whole village offered up their prayers to him. Then we began to cook. Arthur and I had agreed that it should be a huge feast for we did not know when the Saxons would come again and so we wanted to give the people a memory worth fighting for. So we had prepared five deer, two boars, three pigs, six sheep, ten baskets of fresh bread baked on the old season's fires and several barrels of mead. There was cheese and nuts and for the children we had baked little cakes with Bel's symbol, a five-pointed star, scorched onto their crusts. As the meal cooked, the villagers played games. There were pony races, wrestling matches and a competition to see who could lift the heaviest weight. 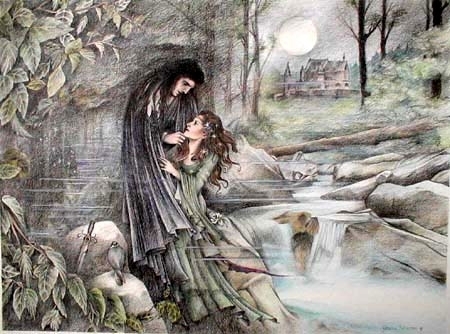 The girls wove flowers into chains, which they then wore on their heads, and, long before the feat had begun I saw young couples begin to slip off into the woods. We ate in the afternoon – as we feasted, the Bards and poets recited their work and the success of their compositions was judged by the length of the applause that each generated. I gave them all presents, even the bad ones and there were plenty of those! Most of the poets were young men who had blushed as they had recited some ode to a village girl who had taken their fancy, and the villagers laughed and jeered and then demanded that the girl referred to reward the poet with a kiss. If the kiss was deemed too fleeting they would hold boy and girl together and make them kiss properly. I drank too much. Indeed we all ate well and drank better. I was challenged to a wrestling match with a farmer friend and the crowd demanded that I accept and so, half drunk already, I clapped my hands on his shoulders and he did the same to me. I could see in his eyes that he was drunk - he could see that I was too and so instead of wrestling we smiled, embracing as only friends can, and then wobbled before toppling over and rolling down the hill in one another’s arms. Somehow we dragged ourselves up again, only to be rewarded by jeers and catcalls for our poor performance. By nightfall I was very mead-fuddled and Ceinwyn linked her arm through mine, kissed me and said, "Lord Derfel Cadarn, I do believe that you are drunk!" "I am that my Lady" I answered. "You will sleep like a Hog and snore like one too" she chided. "It's Beltane" I answered by way of excuse; "Everyone gets drunk at Beltane!" that all's right with the world." and we'd like to thank her for the multitude of submissions she sent in! of Jillbe's who wanted to be published in this issue, and we thank them too! Do not all my offspring call me on this day? Is this not the day I created Arthur? Is this not the day I call forth my Sidhe Tribes? And they sing of three realms and seven directions. Hear me blow my horn three times. When will I gaze upon nature's enchantments? When will the wildlings dance forth? When will I command all Elementals? You will see me at the crossroads. You will see me in your chalice's reflection. You will see me in a thousand ribbons. In the Grove of all Worlds. Together, we dream all worlds. 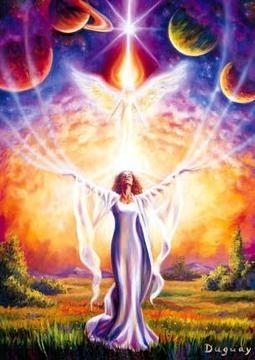 To eternal Fire within your Spirit. Each woman, my eternal consort. and islands with her will. From beginning to the end of time. Yet she is the Creator and Destroyer! her orange crown of power. Without old age, without ages. Through seven periods of the seven realms! Yet she has no young. She has never been seen as a child. Yet all places at once. from middle earth to all realms. Greatest is her symbol on Mother Earth. In the coldness of the moon. In joy I seek silence. I am a being between all realms. I am a dream in my father's head. I am the thirst for ancient texts. I am a prayer heard only in darkness. I am a runner in an invisible race. I am the scribe to a long-dead king. I am night terrors and fierce dreams. I am the sacred soil of an Oak Forest. I am a primordial fern along a riverbed. I am a cricket singing in the night. I am a crow circling above battle. I am a ram with horns of might. I am a pregnant woman clad in furs. I am the eternal scream of birth. I am the alpha of all beginnings. I am all that is immediate. They say I was dreaming. I was a fleeting idea in a spirit. They call me a dreamer. I am the indigo of desert lightening. They say I will be dreamt. I will be reborn to the earthly planes! Can I dwell forever in your crystal realm? And succumb to the scent of your blue roses? I was a whisper carried by air. I have been a shocking meteorite. 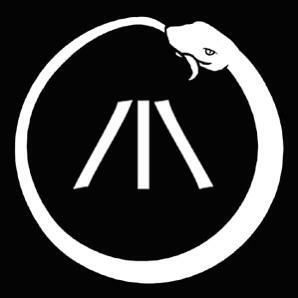 I have been a spoken symbol. I have been a fleeting dream. Dancing through the circle of seasons. I have been a keeper of all secrets. Be one with me, let me be your love. EAST: "I call upon the Bean Sidhe of the East, the washers of the Ford, the bringers of sendings and warnings in beautiful and hideous forms, to witness these rites we undertake tonight..
SOUTH: "I call upon the Dioane Sidhe of the South, bringers of peace, mighty Fennians, fierce warrior elves and masters of all blades to witness these rites we undertake this night." WEST: "I call upon the Sylph Sidhe of the West, the bringers of thought and tranquility, ancient shape shifters and glamour-wielders, to witness these rites we undertake this night. " NORTH: "I call upon the Leanan Sidhe of the North, bringers of inspiration and poetry, relentless muses, to witness these rites we undertake this night." SCRIBE: ABOVE: "I call upon the Aes Sidhe above, our primordial ancestors, creators of all seven realms, to witness these rites we undertake this night." ARCH-DRUID: BELOW: "I call upon the Sidhe within the Mounds below us, to awaken and witness these rites we undertake this night." SERVER: WITHIN: "I call upon the Kin within us, the Spirit of Nature, and of our true selves, the inner 'winged' aspect of our souls, to witness these rites we undertake this night." AD: Of what does the Primordial All-Knowing Mother give that we may know the continual flow and renewal of life? AD: From Whence do these waters flow? 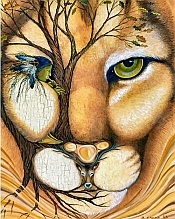 DRUIDS: FROM THE BOSOM OF OUR MOTHER, THE NEVER CHANGING ALL-MOTHER. AD: And how do we honor this gift that cause life in us? DRUIDS: BY PARTAKING OF THE WATERS-OF-LIFE. AD: Has the earth-mother given forth of her bounty? AD: Then give me the Waters! "O Dalon Ap Landu, Hallow these waters by your seven-fold powers and by the three ways of day and one of night. Cleanse our hearts and join us together as we take and drink of your secret essence!" AD: "As the Cyllell is to the God…." SERVER: "…so the Caregl is to the Goddess.."
BOTH: "…and so the two are made one." "This is the Water of Life! 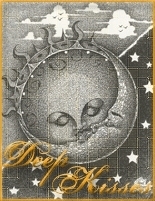 Happy are those who are called to Drink Deep of it. May those who do so never thirst." "Thou art God/dess," and the marking of the Mithril Star in the air. The Scribe returns the blessing and receives the caregl from the HP. The Scribe drinks, blesses the Server, is blessed in return, and gives the Server the caregl. 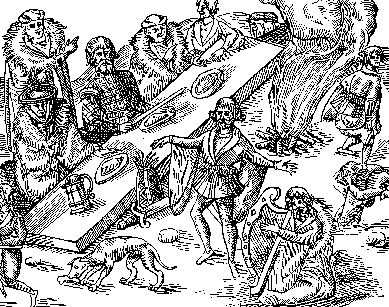 The Server drinks, then goes around the circle of the Grove (usually clockwise) blessing each person, handing them the caregl, letting them drink, being blessed in and exchanging the words "Thou art God/dess," "Drink Deep," or "May you never thirst," return and taking the caregl to the next person. The Server does not drink more than once. To you we return this portion of your bounty, O our Mother, even as we must return to you. The drum roll signals the end of the Service. 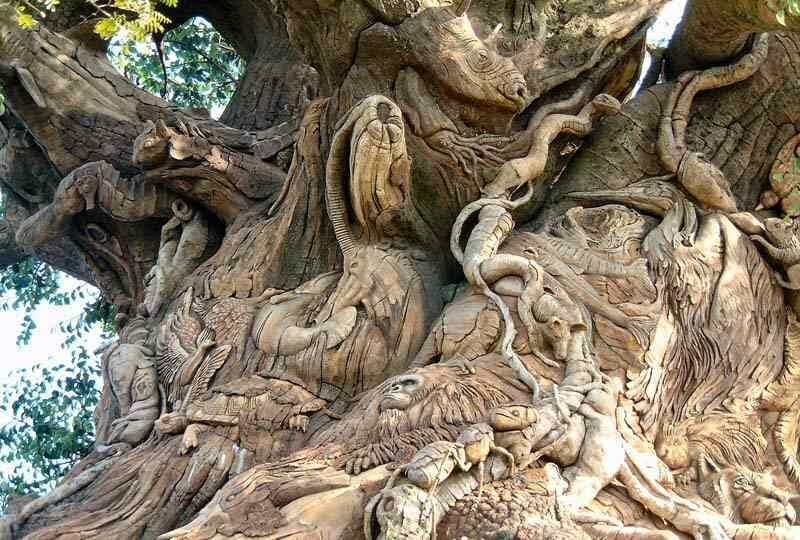 ARCH-DRUID: "Go forth into the world, secure in the knowledge that we go forth with the Earth Mothers blessing, the consent of the Sidhe and Dalon ap Landu's protection." SERVER: "We thank you, o Spirit of Kin within, for your presence this night in our service. Go if ye must, stay if ye will. You are released." AD: "The circle is open, but never broken. Merry meet, and merry part, and merry meet again…"
How many animals/critters can you find in this picture? than the cold one in your hand." When the Great Tuatha De Dannan came to the shores of this reality, they brought with them four Faerie Gifts. These gifts were used in the Creation Battle to dispel the workers of darkness. The Dagda, the great Father-Lord, brought with him the Cauldron (chalice, emotional power). It would produce food for all who needed it, and any weapon dipped in its waters was immediately repaired. 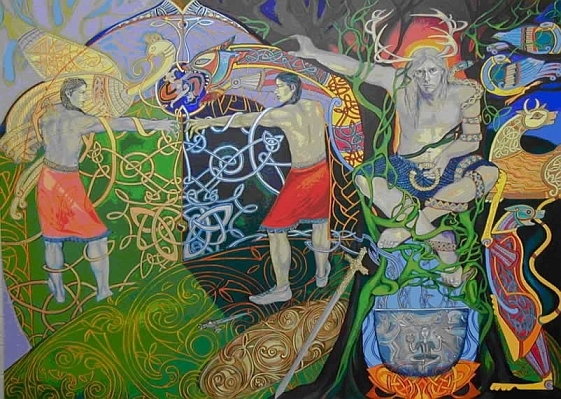 Nuada, the Silver-Armed, brought the Sword (athame, intellectual power). No enemy it was turned upon would succeed in battle. Lugh brought the Spear (wand, creative power). When thrown, it would never miss its target and it would always return to the hand of the thrower. The final was the Stone of Faal, or Stone of Destiny (pentacle, material power). It was the solid foundation upon which this reality was built. 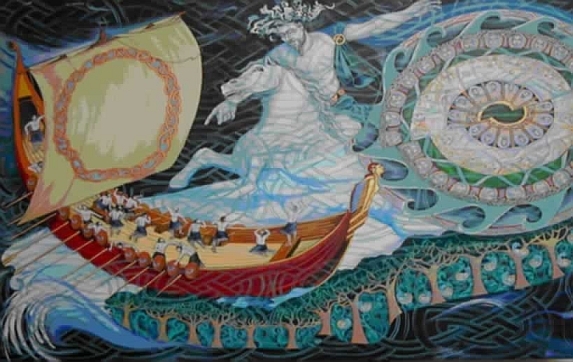 The Tuatha De Dannan won the battle and peace and tranquility reigned for hundreds of years. Then the Milesians (humankind) came, and the Tuatha knew that their time was over. 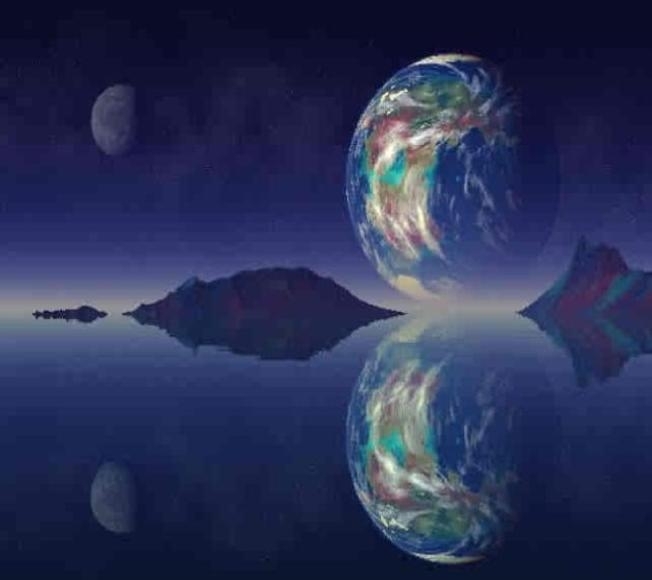 Until this point, the spiritual world and physical world existed on the same plane. 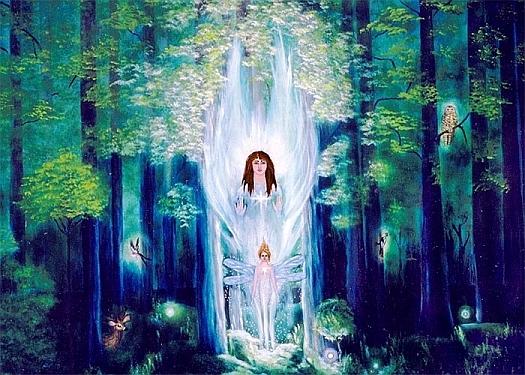 Rather than fight the Milesians, who were born pure of heart, the Great Faeries decided to rip the worlds asunder and split the Spiritual Plane (Astral) from the Physical Plane. But they knew that one plane fed upon the other and needed it for existence. So they created many doorways between the worlds. The "Keys" to these doors are the Four Great Faerie Gifts. They placed the energies of the four keys in the hearts of the Milesian to be drawn upon to enter the Gates to the Other-Worlds. 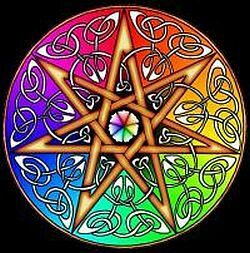 The Spear of Lugh represents the urge to explore one's spirituality. It also represents one's creative urges, inspiration, and young fragile ideas. 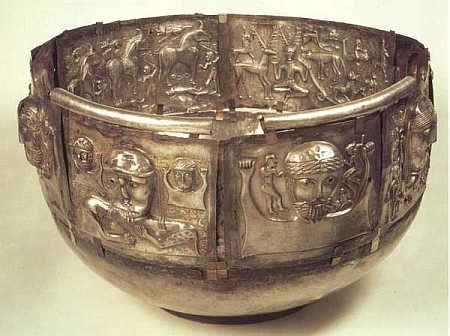 The Cauldron of the Dagda represents ones emotional health, relationships, and the need to connect with others. The Sword of Nuada is the intellectual curiosity inherent in humankind – the need to learn, explore, and communicate with others. 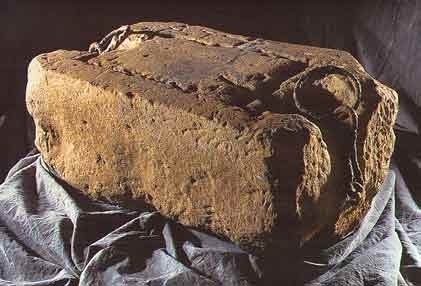 Finally, the Stone of Faal represents the ability to keep one's material life stable; this includes physical health, as well as achieving the means to support and sustain oneself. 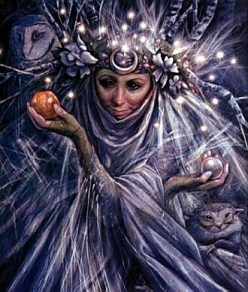 The Faerie Gifts are a way to balance one's life to meet the many needs of the soul, mind, body and spirit. It is vital that the four Faerie Gifts remain balanced in the soul. No one gift should be sacrificed for the other three. For example, one should never explore the spirit realms while ignoring the material level. One should never throw oneself into a relationship at the expense of intellectual exploration. Strive always to maintain this balance. 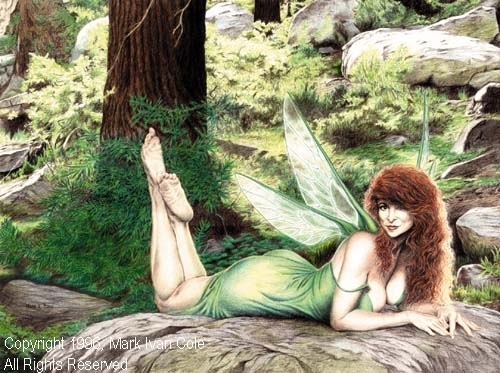 When all Faerie Gifts are tended to, one can achieve a sense of Spiritual, Emotional, Intellectual, and Physical health. -Close your eyes and begin breathing in a slow and steady manner. 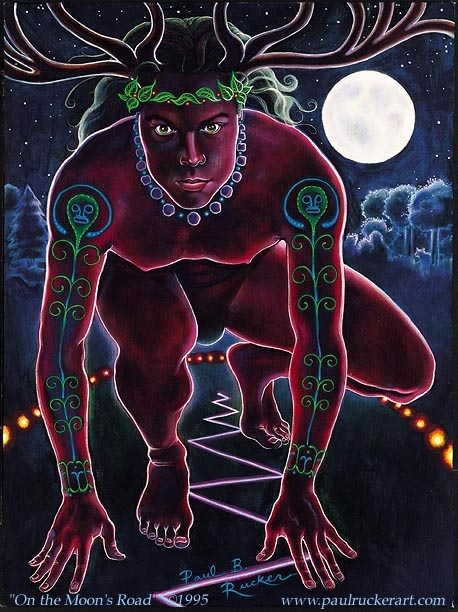 Use whatever methods you need to achieve your shamanic state of consciousness. 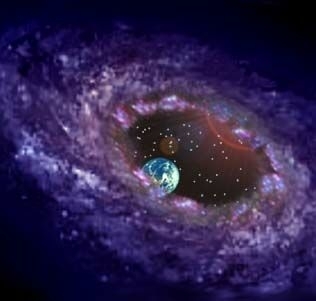 -You materialize in a small clearing with a well in the center of it. Stand for a few minutes and gaze at your surroundings and become familiar with them. Approach the well. -Allow all of your cares, worries, and stressors to materialize as small pebbles in the palm of your hand. Drop them into the well, and watch them disappear into the darkness. When you hear the sound of them hitting the waters, turn and walk away. -You walk down a path into the woods. Small woodland creatures and faeries play and frolic in the greenery. 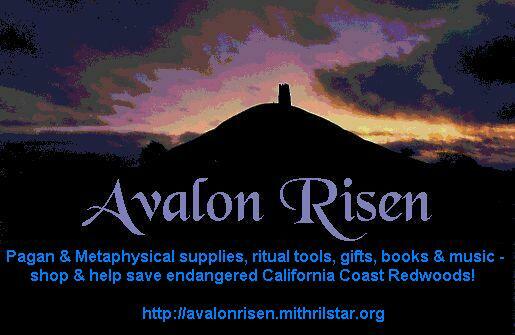 Perhaps your Faerie Guides and Animal Helpers approach you and join you on this quest. You enter a small clearing and sit on the earth. -You see four great trees before you. Each tree has a different symbol glowing in its bark. The first has a red spear, the second a blue cauldron, the third a yellow sword, and the fourth a green stone. Look at the images. Get up and go over to touch them if you wish. Are any of them dimmer or brighter than the others? How does each make you feel? Are you drawn or repelled by any specific symbols. Knowing the basis behind the symbols, intuitively analyze them. Do any of them need to be brightened? Send your power into them and make them burn stronger. Do any need to be dimmed? 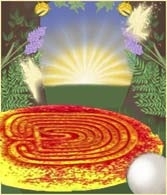 Transfer some of its power into the healing earth. Use all of your Faerie Shaman skills to achieve a sense of balance in these symbols. Remain here for a while. -When you are done, return back down the path. 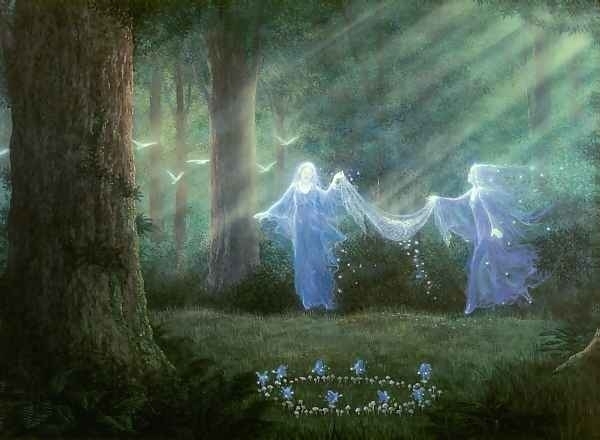 Tell your Spirit Friends good-bye and return to the clearing by the well. Look up into the sky. The sun is setting to the west and the moon is rising to the east. A glowing light surrounds you as you return to your body. -Record your observations and thoughts in your diary. of all which humankind aspires to in its relationship with the planet." Copyright (c) 2007 William A. York. All rights reserved. Will you be a garden or a raindrop today? All the kisses you bring get my temperature right. If it's the only other thing that I do." Things can happen to quiet people. Give you a courage you don't have the rest of the year. With no eyes on you, and no past. Summer just opens the door and lets you out...!" enclosing our porch so we may take in mothers with kittens to foster until the babies are old enough to wean again through FOTAS. Stay tuned for our progress! park. Additionally some of us have also volunteer to "man" the Tree Committee's booth at the upcoming Master Garden Show to pass out booklets on tree husbandry and the local ordinances on land stewardship. Infinite Deities Proto-Grove has had some exciting adventures, including meditating on the beach, and conversing next to a majestic blue lake. We are studying the RDG Druidism 101 course, as well as the "The Bardic Handbook" by Kevan Manwaring. We are composed of five dynamic members: Arch Druid Jillbe, the Contributing Editor of The Druid's Egg; Misty, a long-time Heathen whose love for nature brought her to Druidry; Bird, a lover of trees and creatures who learned mysticism from her father; Viola, an adventurous nature-worshipper trained in Shamanism, and; Melissa, an animal healer and intuitive with an eclectic Neo-Pagan path. We are in the planning stages for a lot of Proto-Grove and community activities, including water-sharing rituals and community tree-planting. The Mother Grove has been extremely busy this season. We've begun doing 2nd degree initiations "live and in person", as some new Pagans have moved into Humboldt County and felt drawn to us and our way of Druidry. 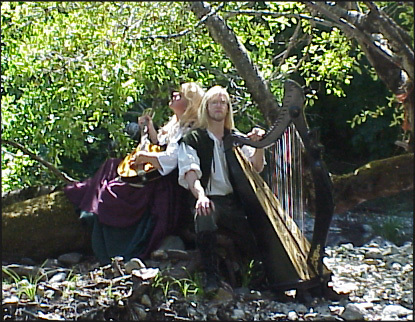 We're also busy preparing for the Druid Gathering this coming August, which will be a very musical one this year, with the official Bards of the RDG, Annwyn and George Leverette providing us with a workshop Saturday morning, and a concert Saturday night. Also on hand with be the OMS' official Bard, Chris Burbick (Antlerchime) who will host the Bardic circle on Friday night. Archdruid Ceridwen has been extremely busy this season with an influx of clients for her Astrology, Numerology and Tarot readings and workshops - and she is thrilled to have a new client "Down Under" whose grandparents are Tribal Aboriginals and who is also showing an interest in our Order! Scribe El has processed 20 new members and 3 new Groves since the last issue, and has expanded his work as "minister of propaganda" into the My Space universe. Four new members have already joined (in just two weeks) and we trust many more will come in as well. All this, plus doing our "day jobs" has been quite taxing but very rewarding. Currently meeting in the lush emerald woods of Fairmount Park in the city of Brotherly Love and Sisterly Affection (commonly know as Philadelphia), Aelvenstar Grove honors Mother Earth. 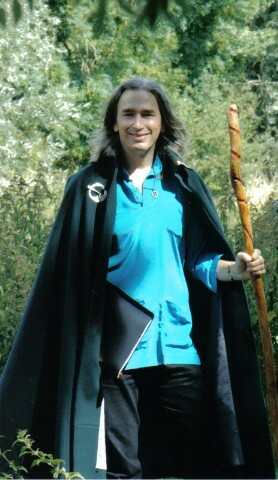 The grove was formally founded Beltaine, 2004 and is a proto grove of the Reformed Druids of Gaia/Order of the Mithril Star and the Reformed Druids Of North America. In addition, we are associated with other pagan organizations such as Per NTR Sesen and Temple Harakhte. 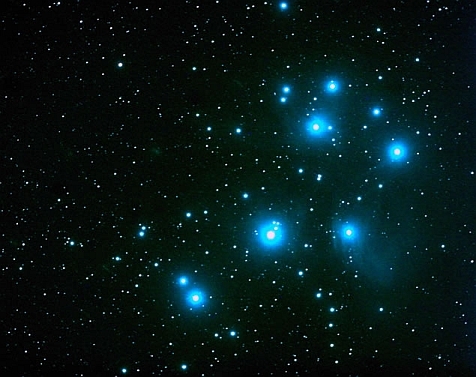 Looking to our ancestors and the ancients, Aelvenstar Druids respect all life and receive inspiration from Nature and the heavens. We believe it is the natural state of Mankind to live in harmony with Nature. and that it is our responsibility to respect and protect the Earth. As activists, it is our responsibility to do our part collectively and individually to heal the environment. 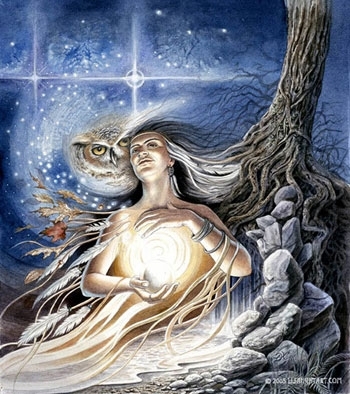 Emphasizing development through the practice of Druidcraft, focus is placed upon personal growth through the development of body, mind, and spirit. 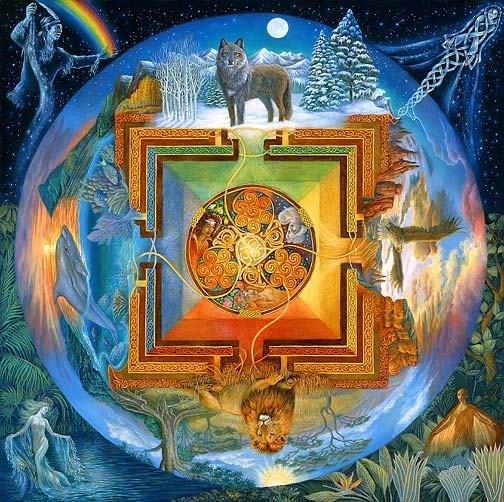 Through study, discussions, rituals, retreats, fellowship, and meditation, a spiritual framework is provided through which Druids may further develop themselves. 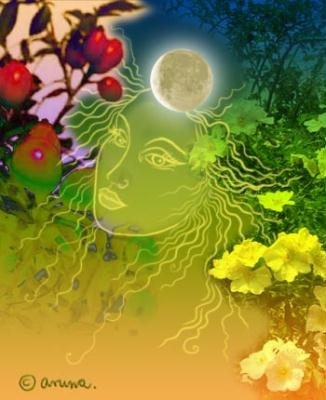 Aelvenstar Grove holds eight celebrations a year, on the solstices, equinoxes, and cross quarter festivals. We sometimes meet on other occasions for outings and initiations. Online meetings and initiations are held too, as some members live a distance away. We welcome new members of all backgrounds who love nature and seek spirituality permeated in the divine beauty and wonder that surrounds us. Nature is groovy! ‘Tween two Equinoxes or two Solstices, past, future, present tense. Dawn breaking, Gaia waking, flowers bloom, brown turns green. Samhain's compliment, the Yang to the Yin. 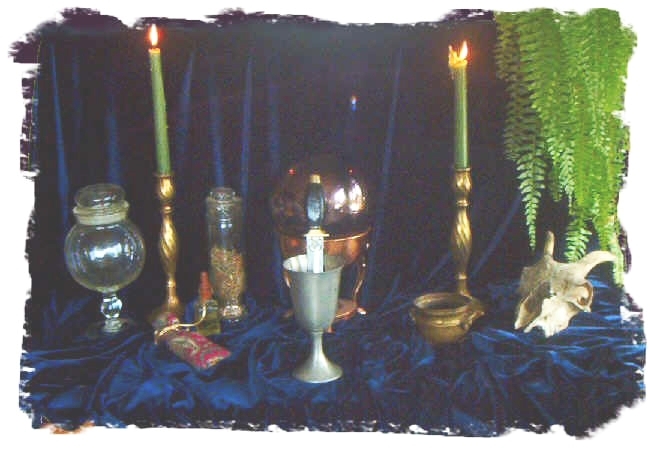 With Imbolc and Ostara, three seed celebrations. 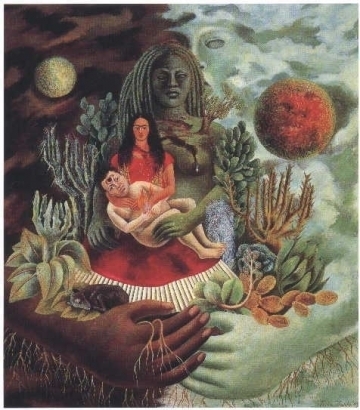 Fertility deserves, does not need salutations. May have shown the Milesieans what the Druids can do. That no line occurs where history becomes myth. Seven Sisters rise just before the sun. Seven joyous sisters, imbibing for fun. Of their engine and pilot, of Taurus the bull. Ride out in the sky with the sun just behind. somewhere in the world, someone is being filled with love and gratitude. You don’t need to go anywhere. The water right in front of you is linked to all the water in the world. "When did I realize I was God? Well, I was praying, and suddenly realized that I was talking to myself." 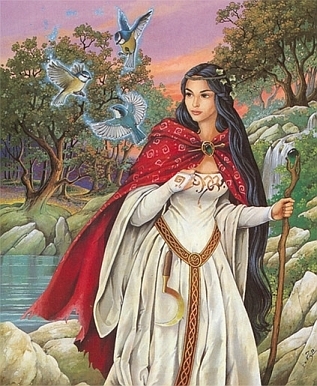 Today is Beltane, Calen Mai, or May 1, 2007 CE. The Reformed Druids of North America were formed on this day in 1961, at Carleton College in Northfield MN. 5 Samradh. Sun is at 15 degrees Taurus. 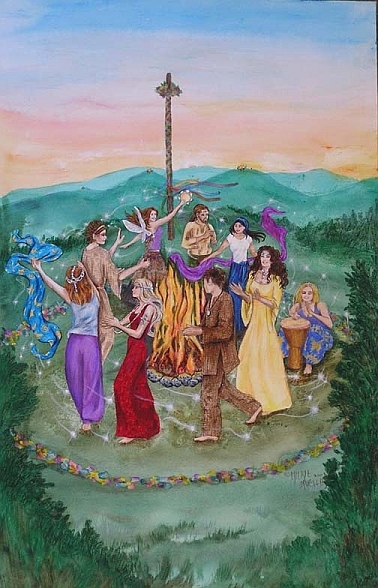 Many Druid groups celebrate Beltane on this day. It is also National Naked Day. 62 Samradh - Deireadh Samhraidh (July) begins (a Sunday - Dydd Sul -- Day of the Birch). 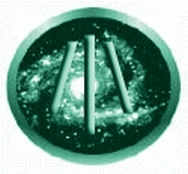 66 Samradh - BGR 05: The members of what was then called the "Covenant of the Mithril Star" unaminously joined the Reformed Druids of North America , thus becoming the "(New) Order of the Mithril Star," one of the "side orders" of the RDNA. 67 Samradh - Birthday of the His Holiness, the 14th Dalai Lama. He will be 72. 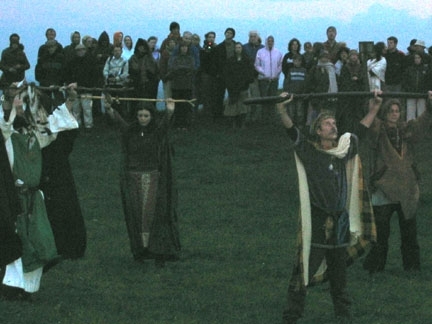 92 Samradh - The Season of Foghamhnar begins at Sunset (1 Foghamhnar, 1 MÌ na Lÿnasa, August 1, 2007). 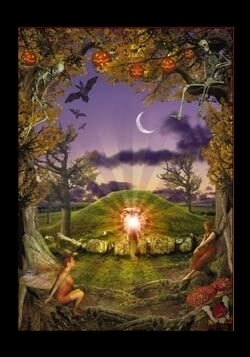 The Festival of Lughnasadh begins at Sunset. "I walk without flinching through the burning cathedral of the summer. It is a fire that solitude presses against my lips." 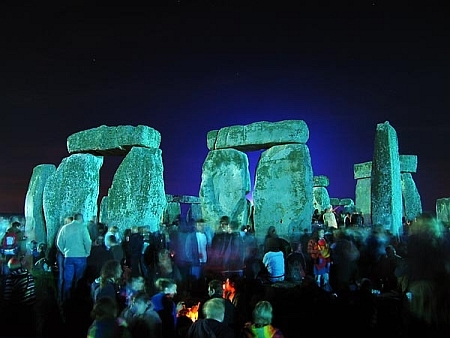 In England, it was the ancient custom on St. John's Eve to light large bonfires after sundown, which served the double purpose of providing light to the revelers and warding off evil spirits. This was known as 'setting the watch'. People often jumped through the fires for good luck. In addition to these fires, the streets were lined with lanterns, and people carried cressets (pivoted lanterns atop poles) as they wandered from one bonfire to another. These wandering, garland-bedecked bands were called a 'marching watch'. Often they were attended by Morris dancers, and traditional players dressed as a unicorn, a dragon, and six hobby-horse riders. Just as May Day was a time to renew the boundary on one's own property, so Midsummer's Eve was a time to ward the boundary of the city. Snakes were not the only creatures active on Midsummer's Eve. According to British faery lore, this night was second only to Halloween for its importance to the wee folk, who especially enjoyed a riding on such a fine summer's night. In order to see them, you had only to gather fern seed at the stroke of midnight and rub it onto your eyelids. But be sure to carry a little bit of rue in your pocket, or you might well be 'pixie-led'. Or, failing the rue, you might simply turn your jacket inside out, which should keep you from harm's way. But if even this fails, you must seek out one of the 'ley lines', the old straight tracks, and stay upon it to your destination. This will keep you safe from any malevolent power, as will crossing a stream of 'living' (running) water. There are also many mythical associations with the summer solstice, not the least of which concerns the seasonal life of the God of the sun. Inasmuch as I believe that I have recently discovered certain associations and correspondences not hitherto realized, I have elected to treat this subject in some depth in another essay. Suffice it to say here that I disagree with the generally accepted idea that the Sun-God meets his death at the summer solstice. I believe there is good reason to see the Sun-God at his zenith -- his peak of power -- on this day, and that his death at the hands of his rival would not occur for another quarter of a year. Material drawn from the Welsh mythos seems to support this thesis. 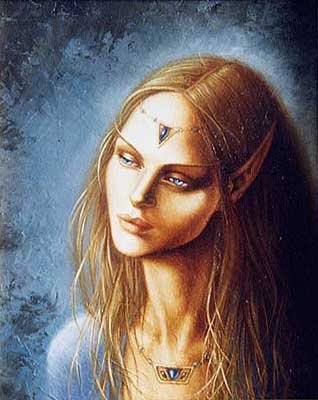 In Irish mythology, Midsummer is the occasion of the first battle between the Fir Bolgs and the Tuatha De Danann. "We're all in place to do something of great magnitude and courage. It does not have to be anything of wide scope, or even something that a lot of people know about. It's about touching the lives of people that cross our path." 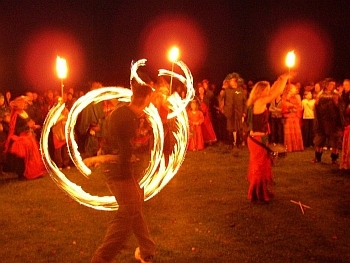 The spiral of the year was and continues to be enacted with bonfires, a tradition revived in the 1920's in Cornwall. The rites hearken back to the ancient practice of rolling a burning wheel down a hillside. In the vale of Glamorgan in Wales, crowds once gathered to watch the spectacle with anticipation. If the cartwheel was no longer aflame when it reached the bottom, it foretold a poor harvest. If however it was still blazing, farmers cheered their good fortune. 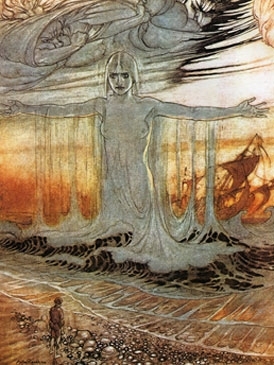 In Ireland, Solstice was understood as one of three nights of the year in which the spirit world was more accessible. At Samhain, or Halloween, and at Beltane the veil parted between the domains of the living and the dead. At Midsummer, it was the fairy folk who joined human revelers. Knockainey, the hill in County Limerick considered sacred to the fairy Queen Aine, glowed with torches in her honor. It is said that Aine revealed herself as the flames died down and lead the villagers home. Her name translates as "brightness" and she is likely related to an ancient solar goddess. 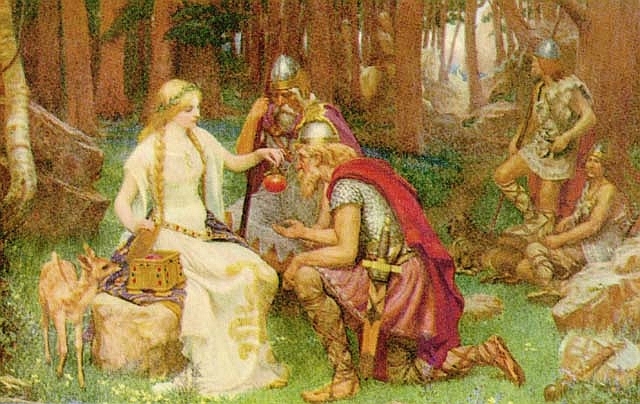 As late as the nineteenth century, families in the area still claimed connection to the fairy queen speaking in endearing terms of her as a woman, indeed "the best-hearted woman that ever lived." On June 24th, when the days begin to get shorter, the celebrations came to a close. After Christianity took root throughout the Celtic lands, the 24th was reserved for the feast of John the Baptist. Preceding Jesus by exactly six months, John was born early to announce Christ's coming. In Britain, St. John's wort is harvested at Midsummer. Valued by Celts as an herbal "demon chaser", the plant is now valued by modern medicine for its anti-depressive qualities. With its vivid yellow flowers, St. John's wort is a symbol of both its namesake and the brilliant solstice sun. "We heal each other all the time, and don't even realize that we're doing it. to another person, and connecting to something larger and unseen."